which is fake, if any? 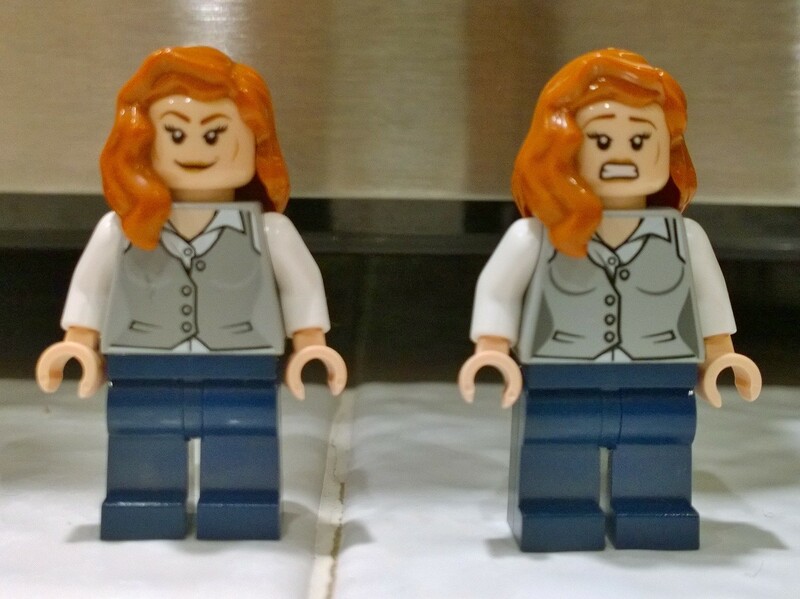 Hi, I notice my original Lois lane (left) had a scratch on it, so I bought the new one (right). The left one is more metallic/silver where the right one is more matte gray. It looks like the machine that prints the torso didn't to a great job, that's all. Probably because it is mainly automated with very little checking by eye on prints. And once they have dumped 10000s of printed torsos into a bin, I doubt they want to sort them. This way we need one big 'fake or real' thread instead of multiple different threads. I've seen at least three 'fake or real' threads during the past few days. If the OP knew both were real, would this be a fake fake or real thread? I'm intrigued by Pitfalls pic there. I get that the printing on the fig on the right isn't quite right but find it extremely difficult to believe that both the torso and head from the same fig in the same set would seem to suffer the same fate... Please correct me if I'm wrong but surely heads and torsos aren't printed assembled (then dissembled) or for that matter that the same printing machine is printing both torsos or heads in the same (or close to) production runs. I cant recall seeing two pieces with such similar errors attached together in the past. 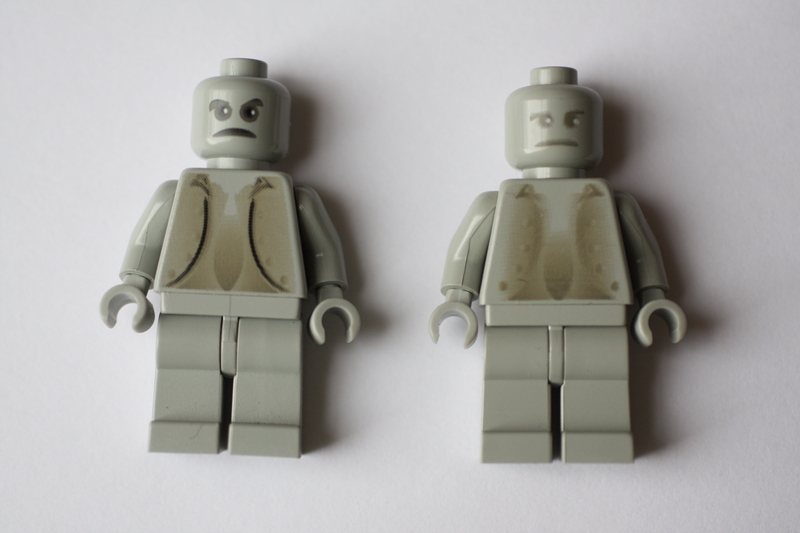 ^ Not sure how likely it is for both the head and torso to be the same, but I can confirm that all of those minifigs I had as a child looked like the one on the right in Pitfall's picture, with both the head and torso prints looking equally faded. These "Peeves" are from my personal collection. I bought the first wave of Harry Potter sets the week they came out. You may find it hard to believe, but it is what it is. 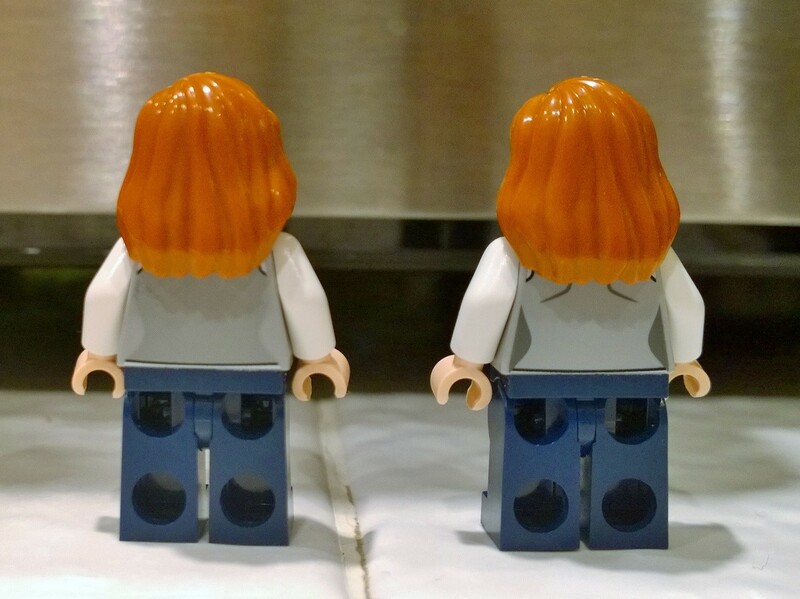 Then the obvious explanation is that Lego changed the print design somewhere in the production run. Yeah" I should also mention that although my Peeves looked the faded one, my friend's Peeves looked like the other one, with the darker print. I was always kinda envious and didn't understand why they were different. I actually thought mine was just the random defective one at the time, and didn't realize this was widespread. Another likely reason is that the print machine at LEGO went low on a certain paint and though their quality check is really high a few colour mistakes do happen. I bought the LEGO City Alarm game and some of the money note prints was without the light green colour. Since both prints were in same box - none of them could be fake. ^ Perhaps with the Lois Lane fig but I think we're all now in agreement that the Peeves fig is definitely a print change. Now for the REAL question...Which came first? The one on the left (which it appears would have required an additional printing pass) or the one on the right? Did TLG decide that the time saved on extra printing justified the change from left to right or were there complaints on the figs initial release about the lack of detail so they introduced an extra pass changing from right to left? It may also be prints made in different factories. So not necessarily a print change in time, but in location. They would likely be bagged together and not mixed with parts in a different factory. I got my Hogwarts Castle set (with the lighter print Peeves) for Christmas a year after my friend got that set for Christmas (with the darker print), if that helps. The sets were purchased a year apart, though that probably isn't enough to determine when they were produced.